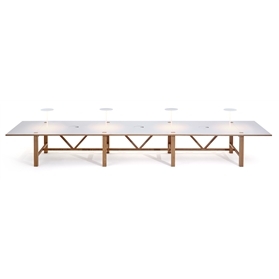 BAE work tables are ideal in workspaces where the collaborative is as important as the personal; the casual valued above formality. Made from solid industrial oak. Option of laminate top with solid oak edge. The top overhangs the structure to avoid generous free leg space and allow two people between each leg, with an additional two people at each end. Option 4 adjustable circular Pablo LED task lights built in.